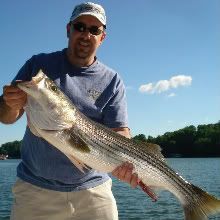 STRIPER SOUP :: View topic - A werid thing happend while fishing. Posted: Wed Sep 29, 2010 1:45 pm Post subject: A werid thing happend while fishing. Me and couple of friends when trophy hunting this last past weekend. You might have saw DA' Barge in one of Shawn's pic's from his trip. We did ok got right around 30 fish over the 4 days from 14 to 26lbs. It was tougher then expected. Anyway, something that has never happened (at least to me) occurred on Monday. We were fishing an area and had gotten a lot of bites/stole baits but not that many fish in the boat. I had a stripe hit a gizzard on an outside board, it popped the board and let go. I fed it some line, fish took it, set the hook, fish let go. Again I fed it some line, the fish took it and I set the hook on nothing. Then for a 3rd time I fed it some line, striper took the bait again and I waited, waited and then set the hook. Something was on the line (figured it was a dead gizz!). This is what I got back!! I guess I let the fish shallow the gizzard and when I set the hook in retrieved a partially decomposed trout, which I had hooked firmly in the tail. I have witnesses! Don't know if it was a one of our trout or not, but it looked to be the right size! Now that was pretty cool. That could only happen to you Mike. You have to share what is up with your trolling motor indicator. Good eyes Bret - Mike, that is a great idea on thevtrolling motor indicator - I seem to always be gophering trying to see which way it's pointed when I go to adjust it - that must help alot. Is that something you made or can you buy it somewhere? Mike, it was made by a friend of a friend over in middle TN. I cannot make an claims of a great idea. Though it is a GREAT idea. I HAVE NOT said "Please move out of the way of the trolling motor" in at least a couple months! I love it. 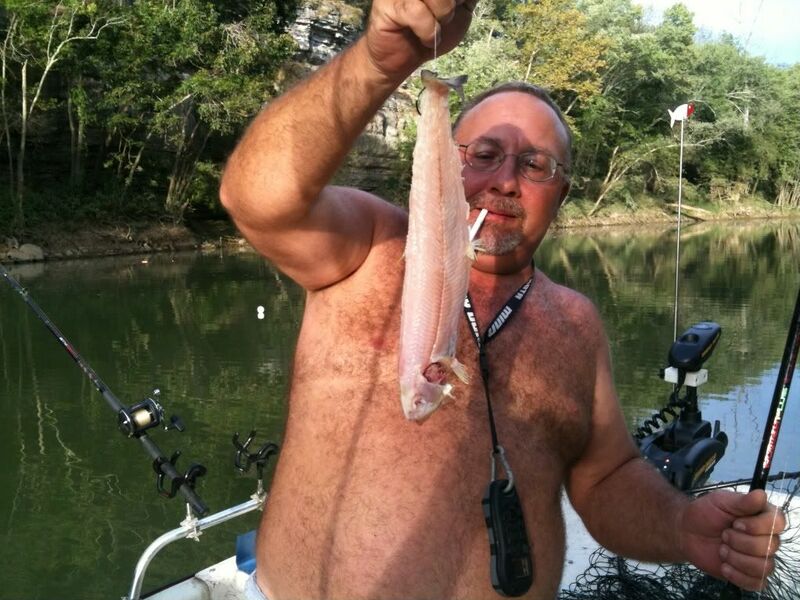 Ezell, that's exactly what I was thinking - if you are on the water enough you will see ALOT of things. We also got a striper hung in a tree and got broke off, we pitched a bait to that same tree on the next pass and it got hung. When the hung hook finally broke free, it freed the stuck striper (we didn't know it was still stuck there) as the two lines tangled and the VERY tired striper was headed in towards the boat, till the lines untangled. We tried to grab the line/striper combo to remove the hook & line but were unable too. Hopefully the fish will make it, it looked to have about 7 ft of line still attached to it. Mike, I know you enough to know you took just a little taste. eh? ehhh?